Pupil Premium is a payment made to schools by the Government. It makes up part of the school’s funding, is received into our budget and is made available for use throughout the whole school. Schools are free to decide how to allocate this funding to best support the raising of attainment for the most vulnerable pupils. In the current school year, Joseph Locke Primary School receive £222,660 in Pupil Premium funding. 28% of children are eligible for Free School Meals (FSM) compared to 24.3% nationally. 26.6% of children have English as an additonal language (EAL) compared to 20.7% nationally. 1.5 additional teachers in Key Stage 2 to reduce class sizes and accelerate learning. Interventions from Assistant Headteacher and a HLTA in Key Stage 1 to accelerate progress. Additional teaching in after school boosters for maths and literacy. Dedicated Speech and Language daily provision including Teaching Assistant support. Funded Breakfast Club for vulnerable families to ensure a good, healthy start to the day. Subsidising enhancement activities such as residentials, educational visits and after school activities. Providing water bottles for all children and school uniforms/PE kits for vulnerable families. Thrive practice implemented and resourced, including Nurture Room and other mentoring programme to support optimal social and emotional development for particular children. Employment of EWO and attendance officer to support of vulnearable families. Reading mentor interventions delivered daily to children who need "catch-up" reading. Expenditure Area Cost How will we measure the effectiveness? After School Boosters £6,554 Measure the progress of children who attend the boosters. Educational enhancements £13,979 All children are able to access a variety of extra curricular activities and enhancements. % of Pupil Premium attending after school clubs. Pastoral (equipment, equipment and programme) £8,702 All children school ready. Accelerated progress for children who receive reading intervention. Measured termly by literacy lead and during pupil progress meetings. In the previous school year, Joseph Locke Primary School received £234,560 in Pupil Premium funding. 39% attract Pupil Premium funding. 25% of children are eligible for Free School Meals (FSM) compared to 24.3% nationally. 28.3% of children have English as an additonal language (EAL) compared to 20.7% nationally. 0.5 additional teachers in Key Stage 2 to reduce class sizes and accelerate learning. Interventions from a HLTA in Key Stage 1 to accelerate progress. Breakfast Club £21,342 For all vulnearable children to improve attendance and punctuality. 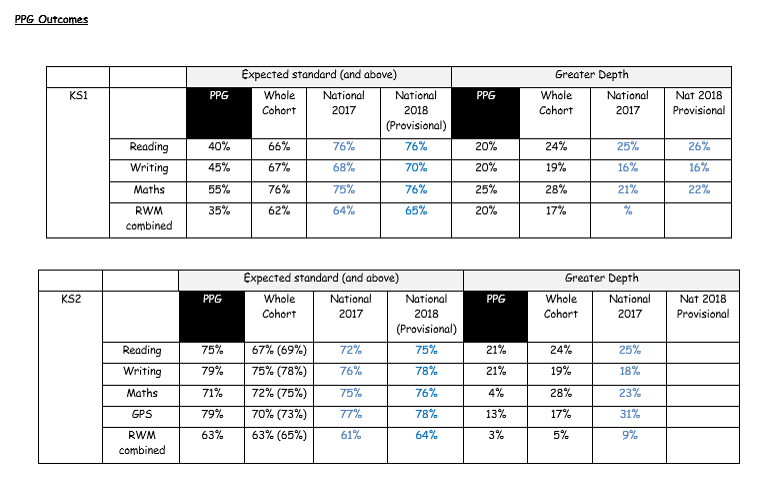 2018 data demonstrates that by the end of KS2 the gap between PPG children and ALL pupils nationally has been eliminated. The following reports highlight how the Sports Premium has been used at Joseph Locke Primary School and the impact this funding has had on the provision of PE within the school.